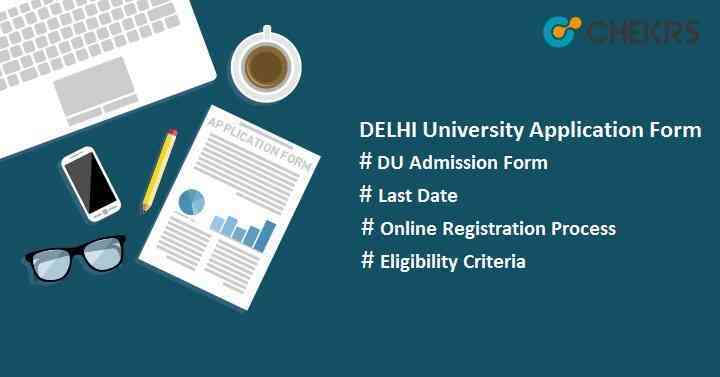 Delhi University Application Form 2019: Delhi University (DU) will notify the admission process for the academic session 2019-20 in the month of April. DU offers admission to the various UG & PG courses through entrance exam or on merit based. DU Admission Form will be filled and submitted through online process. This admission process is managed by the official authority of DU.DU conducts Delhi University Entrance Test (DUET) & JAT for admissions to UG courses. Candidates are advised to go through this article and get information to fill the application form. Other Details Recent, Colored, White Background On white paper with black/ blue pen. Must have qualified 12th or equivalent examination with Physics, Chemistry, Biology/ Mathematics. No age limit will be there to apply for any UG course. Must have qualified with at least 50% Marks in any of the UG degree courses from any recognized university/ institute. Candidates having valid score card in GMAT/ CAT/ XAT/ MAT can get direct admission, they not need to appear in the entrance exam. Foreign candidates who have completed studies in India will be considered as a foreign candidate and can apply for 3% Quota. The Medium of instruction should have been English/ having proficiency Certificate of TOEFL (Min. 70) or IELTS (Min 6 Band)/ ELPC. Candidates must have appeared in GMAT/ CAT/ XAT/ MAT to get admission on merit based. 1.Visit the Delhi University official website. Click on “New Registration” link to and fill the all empty field. Enter the candidate’s name as mentioned in class 10th certificate, date of birth, valid mail id & mobile no. Create a password and re-enter the password, enter security captcha then submit it BY clicking on “Register” button. After completion of registration, proceed to application form by clicking on the link “Continue to homepage” on the left side of the screen. Login to the account by entering the username and password and click on “login” button. The application form page will be opened, fill it with the complete details by providing the personal details, educational details, address etc. Select the courses as many as you want. Click on the “Submit” button and then on “Next” button. Applicants have to upload the all scanned necessary documents. Candidates must upload the scanned image of photo and signature in the given format only. Last step is to pay the application fee. Click on option “Go for Payment”. Select the option between Net Banking/ Credit Card/ Debit Card as per your choice. Enter the card details and then submit it. "Drop your suggestions in below comment box, So we can help you in a better way"
entrance.chekrs.com is a not official website. it is not associated with any Government organisation, Chekrs Provide the information for reference purpose only. which is collected from various online & offline sources. follow the official website only. click here for complete Disclaimer. Chekrs.com- Engineering, Medical, MBA, Law Entrance Exams info Copyright © 2019.